Simply put, college students are paying far too much for their textbooks. Textbooks continue to get more expensive. According to the Bureau of Labor Statistics, textbook costs rose 67% from 2008-2018. College students face many forms of financial struggles—tuition, rent, paying for food—and with less time to work, college costs can become a burden. Students cough up an average of $153 per course for textbooks, according to Kathy Kristof of CBS News. Where is all this money going? 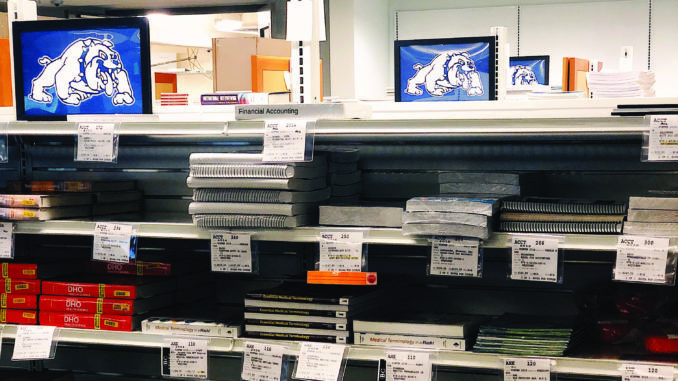 According to figures from the National Association of College Stores, an average of 21.6 cents of every dollar spent on a new textbook will go to the bookstore, and the rest is given to publishers. These prices are impacting students’ success as well. According to Vital Source, 66.6% of students did not buy textbooks for their class, 37.6% of students earned a poor grade because they couldn’t afford the textbook and 47.6% of students take fewer courses because of the price of textbooks. When students’ grades suffer from rising textbook costs, we have to consider other options. Renting textbooks may seem like the perfect solution for college students, but if a student fails to return their textbook on time, the fees can be nearly as expensive as purchasing the textbook itself. According to the Rochester Institute of Technology website, a replacement fee for a book costs 75% of the price the book at the time of the rental, and the processing fee is 7.5% of the cost of the book. These rising textbook prices are alarming, as more and more college students are refusing to obtain a textbook altogether. As college becomes more expensive for students, the need for a college degree grows greater. According to the US Bureau of Labor Statistics, an individual with a college degree earns 64% more per week on average than those with a high school diploma. Finding a job without a college degree can prove extremely difficult in today’s world. Prioritizing the ability to afford an education can lead to more individuals graduating from college, and greater student success. The rising costs of textbooks needs to stop.